In short, specs are more preset now. You automatically learn new abilities as you level, and the skill trees are more about secondary options to customize your playstyle or things you might want to swap on a situational basis. (In this warrior tree, for example, level 15 offers three options on how Charge works.) You might want one abilty for soloing and questing, but another for raiding, and this new system lets you make those changes without much fuss. So far, the system feels a little underwhelming to me. You only get one option every 15 levels — 6 points total — so if you’ve been away and forget to re-assign your skill points, it might be a while before you even notice it. Hopefully the utility of the system will become more obvious as players level to 90 and get into raids and scenarios. In a similar vein, the glyph system has also gotten a facelift. Prime glyphs have been removed (leaving players with three major and three minor), and a ton of new glyphs have been added, which scribes can learn from their trainers and start cranking out right now. I have mixed feelings on this one. Instead of rolling against other players in LFR for loot, one of two things happen after a boss kill: you “win” (rarely) and receive a piece of loot appropriate for your character, or (usually) you get a bag of gold. On the plus side, this streamlines the system, so you don’t have to wait forever for other people to roll (which I could never figure out – where do people run off to after a boss kill?) It’s especially noticeable on the last boss of a raid, where LFR groups don’t mill about for five minutes any more waiting for some dope to hit the roll button. The instant resolution is definitely an improvement. This also eliminates LFR loot whoring, or people rolling on inappropriate gear, or that depressing feeling you get when, for the fourth week in a row, you lose that epic bow off Deathwing to a hunter who’s somehow 26th in DPS in a 25-person raid. There’s something about not rolling against other players for loot that’s somehow less stress-inducing. But for some reason, I worry the math on this will end up working against the players. At least I got to pick what I was rolling on before. Does this new system know what I own or am I going to end up with six pairs of the same bracers? 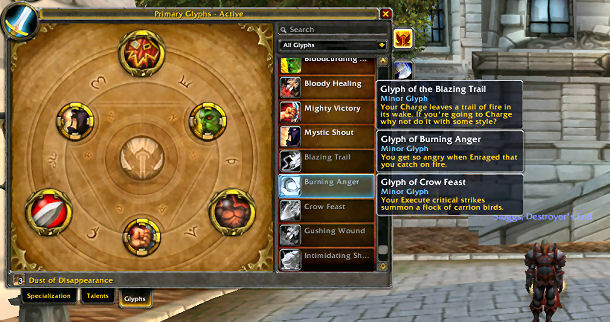 Ultimately, I’ll need to see the system in action in the new Pandaria raids before we know one way or the other. Maybe my favorite change in 5.0.4 – how didn’t this happen sooner? Kill 15 mobs, click one, get all their loot at once. I’ve already experienced this awesomeness firsthand while farming BC dungeons for xmog gear, as it makes looting way, way, easier. Huzzah! I’d totally forgotten this was coming: the ranged slot has been removed from the game, leaving just the main hand and offhand slot. No more guns for warriors or rogues, no more relics for pallies or DKs, and wands are now the equivalent of spell daggers for mages and priests. Although I feel a pang of nostalgia for the way I used to range-pull Stratholme on my warrior in vanilla WoW, the loss of stat sticks isn’t a big deal. With one exception: my hunter can no longer carry Kiril, Fury of Beasts. Because watching my worgen hunter grow to OMG GIANT SIZE every time that polearm would proc never got old. Warrior. A lot of stance-related stuff has changed. All abilities work in all stances, which makes stance-dancing a thing of the past. While Defensive still cuts damage and generates threat, the main difference between Battle and Berserker is how they generate rage, as Berserker no longer gives its traditional 10% damage boost. One thing I like: with the skill tree changes, swapping between Single Minded Fury (two 1-handers) and Titan’s Grip (two 2-handers) no longer requires respeccing, which will be awesome once Pandaria hits and players are continually upgrading weapons via questing and dungeons. Hunter. Obviously, the ranged slot is gone, so your bow or gun simply goes in your main slot. My favorite change: no more minimum range! It’s funny, I used to laugh at hunters who wouldn’t shut up about it, but I’ve really enjoyed this so far, especially while soloing older content. Rogue. Poisons no longer need to be purchased; you have a bag with an endless supply in your spellbook, and you can have one damage-dealing poison and one “utility” poison active at any time. Also, the need for a fast dagger for your offhand has been removed (although I have to admit, I’m still not entirely sure what this means for rogue weapons overall). Mage. Even though Fire was the (ahem) hotness throughout Cataclysm, I’ve stuck with Arcane, as I’ve found it a nice “comfort” spec. The Arcane rotation has been tweaked slightly for Pandaria, requiring a little more balance between Arcane Blast/Missiles/Barrage, but I really like it so far. I’ve run LFR a few times just to get a feel for it, and it might be my favorite Pandaria spec so far. Also, you don’t need help summoning a refreshment table any more. Yay! Paladins. I’ve always been a terrible ret paladin. Seriously. 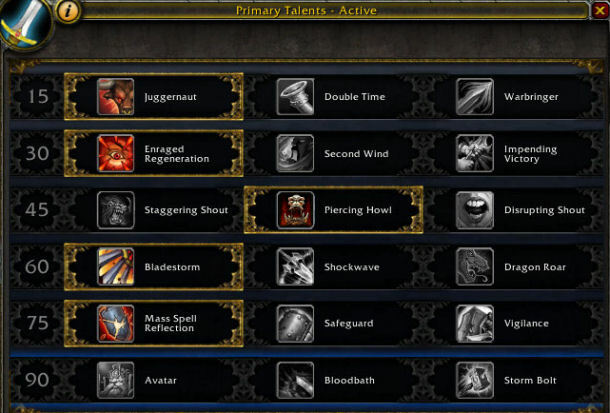 I leveled mine to 85 at the start of Cata so I could get his professions up, and never got comfy with the DPS rotation. So when I logged in this week and saw that auras had been removed, replaced with seals, I somehow turned into an even bigger doof, staring at my hotbar wondering, “wait, so what do I do now?” Answer: Roll a monk. Just as Deadmines and Shadowfang Keep were overhauled with level 85 heroic versions for Cataclysm, two more classic dungeons – Scholomance and Scarlet Monastery – have gotten the same treatment for Pandaria. The level 90 versions can’t be played yet, but the lowbie versions are live, and it feels a little weird wandering through the remixed versions. Scholomance, which used to be a sprawling dungeon with all sorts of side bosses, has been tweaked into a more linear affair. Jandice Barov and Rattlegore are back in new areas, along with a few new bosses. Of course, Darkmaster Gandling is still the finale, but at least in the lowbie version, you don’t have to clear any of the side rooms. So are Kirtonos the Herald, The Butcher and Ras Frostwhisper gone forever? I’m hoping they’ll make their return at some point. Scarlet Monastery has been overhauled even further. The four wings have been condensed into two, with the Library and Armory in one wing (“Scarlet Halls”) and the Graveyard and Cathedral in the other (“Scarlet Monastery”). A lot of the old bosses return but in new encounters, including some new mechanics that I wouldn’t be surprised to see turn up in raids down the road. 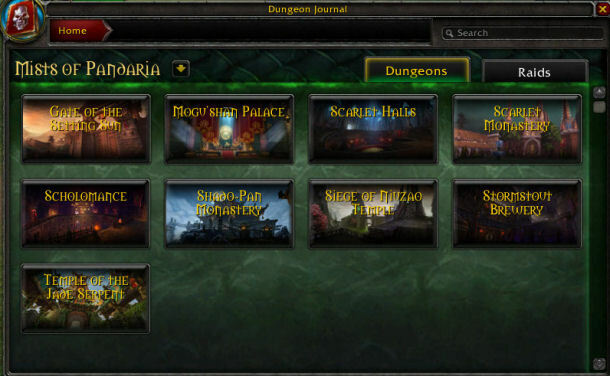 A lot of people tend to forget this feature exists, but Shift-J will bring up your Dungeon Journal, which includes detailed info on new Pandaria dungeons and raids. In addition to the new Scarlet Monastary and Scholomance, you’ll find detailed info on six new Pandaria dungeons, including maps, boss abilities and loot drops. Of more interest to me, however, is the raid section. You’ll find three traditional raids listed with six bosses each (Heart of Fear, Mogu’shan Vaults and Terrace of Endless Spring), all with LFR options, and a fourth “Pandaria” section covering the two new roaming world bosses (Sha of Anger and Salyis’s Warband). Blizzard has already announced that there will be staggered releases for the raid content, starting with Mogu’shan Vaults, but if you want to get a sneak peek at the raid content, this is a great place to start. If you’re wondering, “cross what?,” don’t feel bad. As a way of making older zones feel busier, Blizzard rolled out new tech in 5.0.4 where people from different servers can find themselves sharing the same zone. So if only three people on your server are in Zangarmarsh, you might start seeing other people from other servers popping up. In theory, it’s a way of making older, underpopulated areas feel more alive. But I’m not convinced this won’t do more harm than good. People are already complaining about competing with players on other servers for mining and herbing nodes in older zones at 1AM, which is beyond ridiculous. Will people from different servers be competing for pools during fishing contests? 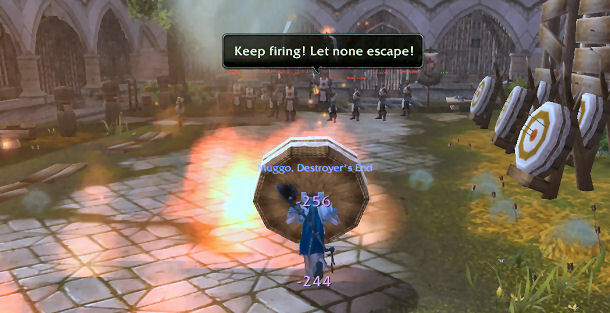 Will lowbies suddenly be fighting for quest mobs with people from other realms? Obviously, it’s too early to say anything for sure, but hopefully this is just a first step towards Blizzard implementing some cooler features. Over the last year, I’ve found WoW players fall into one of two categories. The first will have varying levels of interest in the first nine items I’ve listed in this post. The second, larger than I’d care to admit, couldn’t care less about any of this stuff; the only aspect of v5.0.4 that matters is that pets, mounts and achievements are now shared account-wide. So that rare pet that dropped in Magister’s Terrace or that mount you won in a Sarth 3D run can now be used by all your characters and adds to your overall achievement total. Don’t get me wrong: this is an awesome thing. Before the patch, I had a DK with 8k achievement points and a warrior with 11k, with a fair amount of achieves that didn’t overlap. So now I’m up to 13k and all my characters have access to all my pets and mounts, so that’s pretty cool, especially as Blizzard prepares to roll out the pet battle system. Still, it’s been fascinating to be to watch the emergence of this pet-obsessed subculture within WoW, players who are “casual” in almost every sense of the word but begin drooling at the mere mention of a new mount or pet. It’s hard not to see Pandaria‘s family-friendly Kung Fu Panda vibe and Pokemon-esque pet battling system as a bit of a nod to that populace, and it’ll be interesting to see if the battling system takes off and where the game goes next.